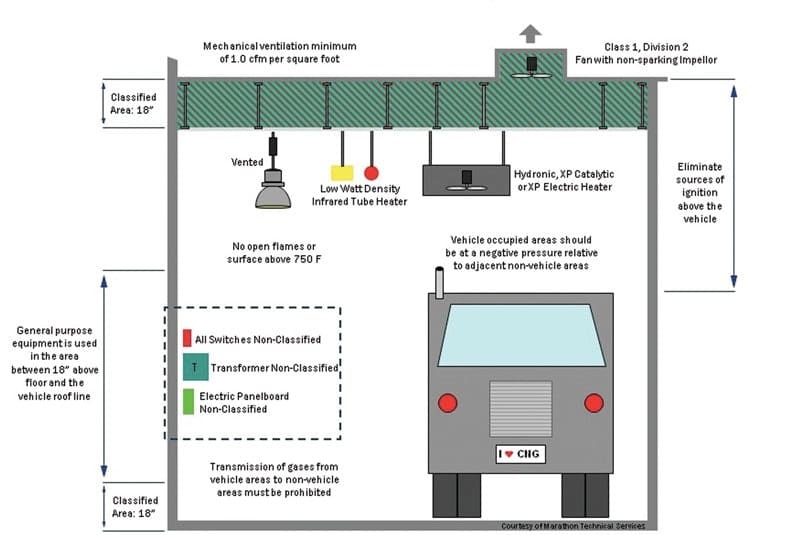 Photo courtesy of Marathon Technical Services (CNG fueling station and CNG garage facility upgrade design experts; www.marathontech.ca). 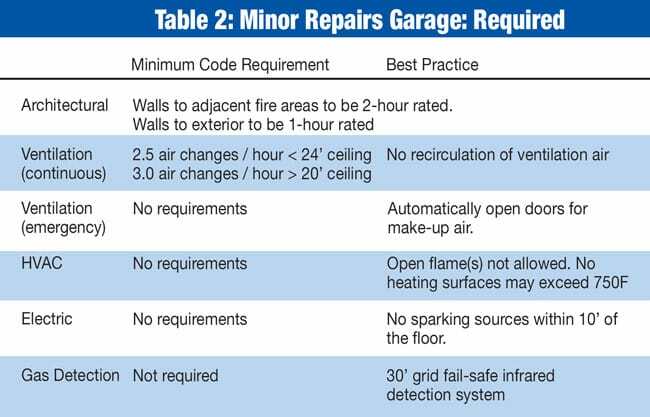 • Minor Repair Shop: This includes service activities that do not impact the fuel system or generate heat in excess of 750° F (welding, grinding, etc.). It does include brake repairs, tire work and PM activities. 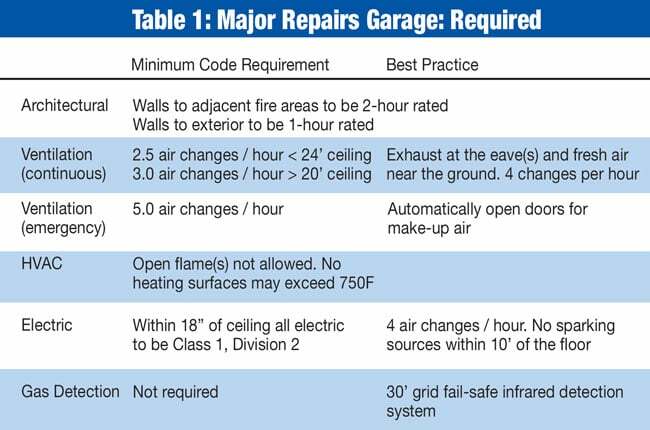 • Major Repair Shop: These include areas where there will be welding, vehicle body work or engine overhauls. Fuel system work may also be performed here. The type of shop and the applicable codes should help create a code-minimum list of required building improvements. Keep in mind that the overlapping codes do not always offer the same requirements. Where disconnects are noted, contact the local AHJ for their interpretation. It is much better to get the clarification while in the scoping and design development phase, rather than when the upgrades are complete and the AHJ will not allow operations to begin. Note: Tables 1 and 2 are subject to State/local code amendments, as well as future changes to codes. Evan Williams is a Design Project Manager at Cambridge Companies (Griffith, IN), a design-build firm working with the waste industry for more than 20 years. During this time, more than 100 solid waste design-build projects have been completed, including new build, repairs, upgrades and/or modifications at transfer stations, recycling centers/MRFs, hauling companies, landfill facilities, office buildings and more. Cambridge continually monitors the industry to determine any new needs, changes or improvements that will benefit their clients and improve their design-build solutions. Evan can be reached at (219) 972-1155, via e-mail at EvanWilliams@CambridgeCoInc.com or visit www.CambridgeCoInc.com.